Nestled on the terraced lands of western Troup County, GA that were formed by generations of water flowing thru the Chattahoochee River basin and by the backs of mules worked by sharecroppers in the early 1900’s, resides Retreat on West Point Lake. A gated community established in June of 2010 along the shores of West Point Lake. Offering residents respite from the stresses of a busy world all within a stones throw of neighboring LaGrange, GA.
Retreat is as much a state-of-mind as it is a place called home. Whether it’s a simple lake haven to escape to, or a primary home to settle into on a more permanent basis, Retreat is a celebration of nature, offering an inspirational refuge to enjoy the great outdoors. 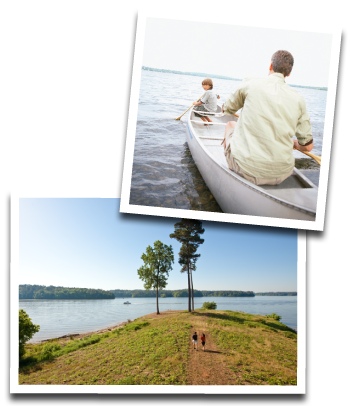 With gracious home sites exceeding one acre in size, each carefully planned building site was designed to enable access to the lake while blending in with the rolling topography and dense tree canopy. Situated along 8 miles of shoreline on West Point Lake a mere 12 miles from the quaint town of LaGrange, Retreat has become a gathering place for those wanting to leave the crowded world behind. With architecture guidelines designed to complement the natural landscape, not compete with it, homes in Retreat are encouraged to use native materials of natural stone, brick, timbers, cedar shakes, architectural roof shingles, metal standing seam roof accents and wooden porches. Come on…have a look. You’ll be as inspired as we were.